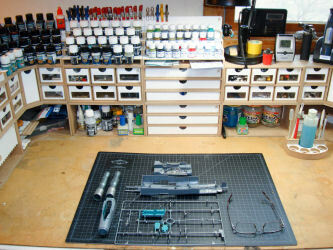 A few months ago, a number of factors came together to stifle my creativity on my hobby workbench. 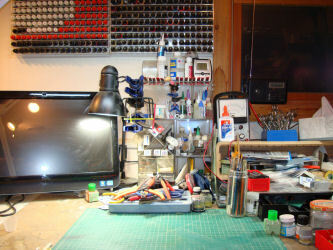 In a previous 'update' of my workbench, I had decided to add a Dell all-in-one computer to the bench so I could access photo references on a nice-sized screen. Then Microsoft started to roll out Windows 10 and while my primary computer made the transition with minimal fuss, but it turned out that the Dell was not compatible and no upgrades were going to get it there. Running on Windows 7 wasn't a problem until Microsoft changed its Windows 10 rollout from optional to mandatory download. After a few attempts to roll back the new operating system, my Dell died. In addition to my computer woes, the clutter on my workbench was getting out of hand. 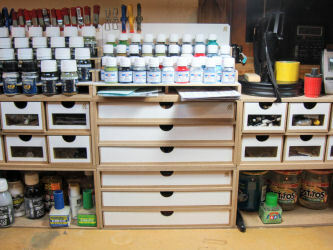 You can see in the image above that storage on my bench was a challenge, though I was really happy with the 17ml paint bottle racks I had previously found on eBay four years ago (unfortunately it doesn't look like these are available any longer). When I add a keyboard or even just room for a mouse, plus a model in progress, the clutter was frustrating. I needed a solution for my bench. That's when I learned about the HobbyZone modular workshop system. I found a few places in the US that supposedly carried the modules, but they seemed to be constantly out of stock on many items. I wound up contacting the folks at HobbyZone in Poland (where these products are produced) and before I knew it, I became a US importer of the line ( www.hobbyzone.biz). One gratifying aspect of this experience was finding many others in the US and Canada who are also looking for a source for these products, so now we're getting frequent shipments from Poland and even more folks are discovering the HobbyZone line. How useful are they for storage? Which modules and how many will be needed to 'fix' my workbench? After building all of these modules (including those which I didn't write up), I discovered no surprises and no challenges in assembly. I used Gorilla non-foaming Wood Glue which is an epoxy-based glue which dries relatively quickly and dries clear. I was initially careful about the amount of glue I used in assembly but as I gained experience, I just let excess glue ooze out wherever it wanted. When the assembly was complete, I'd simply take a wet paper towel and wipe away any excess glue. In one case, I had a blob of glue that was inside one module that interfered with one of the drawers. A quick removal of that dried blob with my X-Acto knife resolved that easily. As I mentioned in my Paper Towel Module review, the module was designed for European paper towel rolls which aren't as wide as US paper towels. The folks at HobbyZone mentioned that one brand available in the US called 'Sparkle's Mini' will fit the module, but according to my measurements, I should be able to get a regular roll of towels in there as well. When you install the dowel and the two inserts into the paper towel module to hold the paper towel roll, the module interior isn't wide enough for most US towels. I solved the problem by NOT installing the inserts or dowel and my holder can accommodate most brands of paper towels. One shortcoming I found in the HobbyZone modules was storage for larger (taller) items. There are two 'Work In Progress' (WIP) modules which have clear Plexiglass doors to protect items inside, but the intermediate shelves are only half-width. While I can see use for these WIP modules, it didn't address my need for stashing taller bottles. I've been using recycled jars to hold various cleaning fluids like Windex, Odorless Mineral Spirits, and Enamel Thinner, and the jars I selected keep evaporation under control and keep the cats out of harm's way (I caught one of our rescue cats licking the Windex out of an open container prompting the change to these jars). So taking a look at how these modules come together, we'll start on the left side of the bench. Here was have on the left the OM01 Six-Drawer module atop the OM08 Paper Towel module. The OM07 Brushes and Tools module sits on top and you can see how much that module can hold. Next door, we have the OM03 Corner Drawers module atop the OM04 Corner Shelves module with an OM06b 36mm Corner Paint Rack module on top. The drawers in the OM01 and OM03 are identical and interchangeable. They can hold lots of smaller items and the Plexiglass windows on the front of the drawers make it easier to find what you're looking for. Finally, we have the OM01 atop another OM08 Paper Towel module, but this module doesn't have the white door installed and is being used as the taller bottle storage hutch. An OM05b 36mm Paint Rack sits atop these modules. 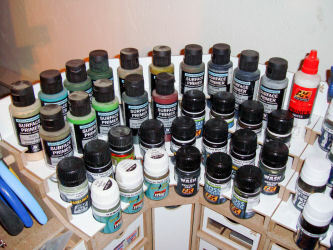 A note about the various paint racks produced by HobbyZone. The OM05 series are all linear racks while the OM06 modules are corner racks. The b versus s suffix determines if the rack has the larger 36mm holes (b=big) or the smaller 26mm holes (s=small). There is also a u suffix for no holes, these are simple shelf modules (OM05u and OM06u) and an o suffix for a slotted rack for holding oil paint tubes (OM05o only). Moving to the center of the bench, we have the aforementioned OM01 and OM08 with an OM05b on the left and another OM01 and OM08 on the right. There is no other module atop the right modules because they sit under my window and provide a convenient place to park one of my lamps. In the center we have the other key storage module, the OM02 Three-Drawer module, one atop another. 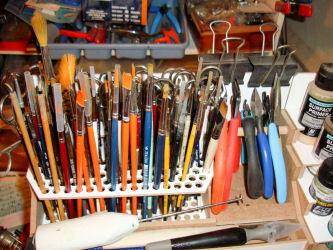 These hold my longer tools/items and also include dividers which can provide even more refined storage options. 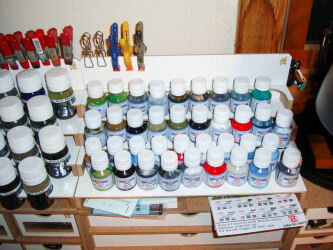 The paint rack atop the two OM01s is an OM05u Paint Shelf which is useful for holding bottles that aren't 26mm (Vallejo 17ml, AK Interactive 17ml, Hataka 17ml, Mig 17ml, etc.) 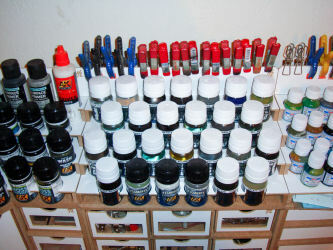 or 36mm (Testors ModelMaster, AK Interactive/Mig/others 35ml, Humbrol/Xtracolor/WEM tins, etc. ), in this case, my AKAN paints. 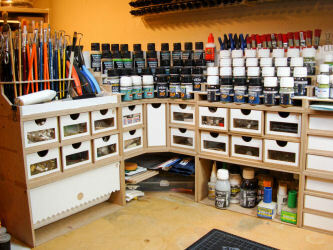 On the right side of my bench, I added another OM03 Corner Drawers module over an OM04 Corner Shelves module. Since this too is under my window, I didn't add any racks above these but instead have another lamp and Dremel charger parked up there. I left the right side open as my paint booth is further to the right and I have my airbrush holder nearby. 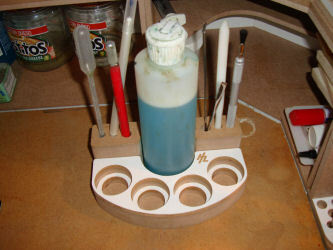 You do see the PN01 Brush and Tool Holder against the OM04 to provide a place for my regularly used brushes and such while I also have an SM01 Painting Tools Stand which has four holes for 36mm bottles plus a larger hole perfect for my Windex applicator bottle and holes behind it ideal for holding my X-Acto knife safely nearby. Taking a closer look at the top modules, the OM07 Brushes and Tools module has a variety of hold diameters in that rack so it not only holds my brushes, but my forceps and scissors as well. I was skeptical of the wood dowel on the right side but it does hold my cutting tools and pliers quite nicely. 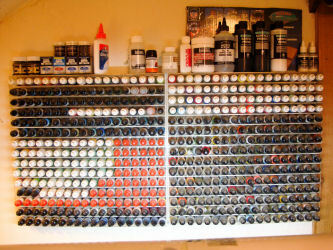 You can see the variety of paints that come in the 36mm diameter bottle size in that OM06b Corner Paint Rack module. The backboard on these paint rack modules is nice for holding my various clamps. The OM05u Shelf module has two nooks under the bottom shelf handy for holding special decals and paint references. 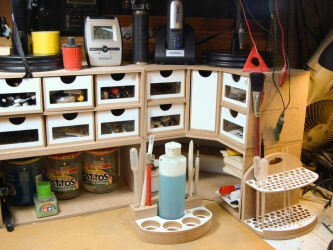 So there you have it, my Workbench 2.0. I'm finally back where I can build again and as I get to know this system better, I know I'll be 'fine tuning' the arrangement as needed. What is also nice is that I still have room to expand by adding a third level of storage modules should the need arise. If you look at some of the images on the HobbyZone USA Facebook page, you'll see other arrangements of these modules as individual workspace size and needs dictate. Give some of these a try. I started with just a few and continued expanding until I figured out what I really needed for storage and convenience. Your requirements will likely be different than mine. 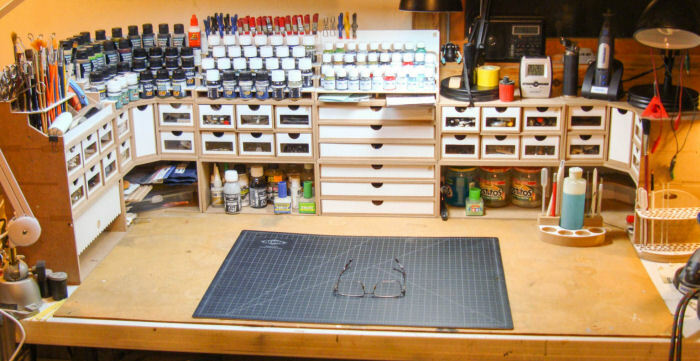 In any case, I finally have the best organization I've ever had on my workbench. Let the projects resume!